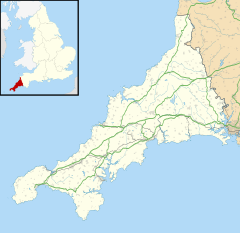 Ladock (Cornish: Egloslajek) is a village and civil parish in Cornwall, England, United Kingdom. It is about six miles (9.5 km) north-east of Truro. Historically, Ladock was two small settlements; Bissick by the river and Ladock on the hill. Notable features include the church, the school, the village hall and the Falmouth Arms pub. At the 2011 census the total population was 4,241. The village had a station, Probus and Ladock halt, on the Cornish Main Line railway but services to the station ended in 1957. The parish church of St Ladoca has a fine west tower built of granite blocks. The north side of the church is 13th-century in date while the south aisle is 15th-century and the chancel was much altered by George Street in 1862–1864. Interesting features include the carved base of the rood screen and the font of Catacleuse stone. The feast traditionally celebrated in the parish is held on the Sunday after the first Thursday in January. Ladock, in a joint venture with the nearby village of Grampound Road, has launched an effort to be Cornwall's premier sustainable village and set an example for the rest of the county. The scheme has been orchestrated by The Ladock and Grampound Road Transition group. The group today consists of around fifty active members and was set up in 2008 by people within the community concerned about socioeconomic and environmental issues such as climate change, the rising cost of oil and population growth. In 2009 the transition group submitted an application for a nationwide government grant which they subsequently won. The grant of £500,000 was given to twelve varying communities across England and Wales to find out how small-scale communities could reduce carbon emissions from the bottom up. The communities are acting as test-beds for achieving sustainable living on a community-wide scale. In 2010 the villages together were named Cornwall Sustainable Village of the Year and awarded an additional £1,000 first prize to be invested in the community. The transition group encompassing the two villages has been praised for its high scores in five categories – local economy, village amenities, renewable energy and reducing environmental impact, plans for the future and the buzz factor. As of early 2011, the project had completed the installation of carbon-reduction measures in sixteen homes (with varying housing types, age and occupancy), two schools, six local businesses and two community halls. Measures include heat pumps, biomass boilers, solar photovoltaic and solar thermal panels, as well the installation of dry lining and insulation in many properties. In addition, smart meters have been installed in participating properties to assist the monitoring of the behavioural change activities. The overall aim of the scheme is to deliver a reduction of 33% to the current carbon emission, equating to a saving of 123 tonnes of CO2 a year. In the wider community, a carbon sequestration project has seen the planting of fruit and nut trees and 5-acre allotments site to naturally absorb and hold carbon while providing a boost to local food production. A community owned 20k wind turbine has also be installed. The generation of energy by means of renewables will be sold back to the National Grid, with money being generated via the government’s adoption of Feed-in tariffs. A community managed fund will be set up to ensure that income made by electricity generating aspects of the scheme remain a rolling resource that will benefit the wider community. Income from feed-in tariffs and anticipated Renewable Heat Incentives from the government will be reinvested in more carbon saving measures so that the benefits of the programme of will far exceed the initial targets of the project. ^ Place-names in the Standard Written Form (SWF) : List of place-names agreed by the MAGA Signage Panel Archived 2013-05-15 at the Wayback Machine. Cornish Language Partnership. ^ "Ladock, St Clement and St Erme ward 2011 census". Retrieved 6 February 2015. ^ "Two named winners in Cornwall Sustainable Village of the Year competition". This Is Cornwall. Retrieved 8 April 2011. ^ "Low Carbon Living Ladock and Grampound Road". Community Energy Plus. Archived from the original on 12 September 2011. Retrieved 8 April 2011. This page was last edited on 23 December 2017, at 05:36 (UTC).